“You sure look good for 90 years old! Do you have a painting of you in your attic that is getting really REALLY old looking?" No, there's no Dorian Gray picture decay going on. The Internet aged me. The day before I turned 45, I wrote a column of the 45 Lessons Life Taught Me. I added five more lessons when I turned 50. My Life Lessons ended up e-mailed around the world. Then someone changed my age on one email to read: "Written by Regina Brett, 90 years old." Another person attached a picture of lovely older woman older. No, that dear senior citizen isn’t me. It’s fashion designer Iris Apfel. For the record: I’m only in my 60’s. I hated to break the news to Berthabelle in Eugene, Ore. who wrote: "We are the same age except I was born on November 1, 1918. Hope some day we can hear from one another. Isn't it great that we are both ninety? Lovingly, Bertie." Growing old beats the alternative – dying young. That’s one of my life lessons. People have shared my lessons across the globe. That’s why I turned them into books, first God Never Blinks: 50 Lessons for Life's Little Detours, Be the Miracle: 50 Lessons for Making the Impossible Possible, and now God Is Always Hiring: 50 Lessons for Finding Fulfilling Work. The lessons reflect what I learned from life as a single parent for 18 years, struggling to find the right partner in life, battling breast cancer and healing the bruises from a bumpy childhood. And they reflect what I’ve learned from readers in my 30 years as a journalist. I'm grateful to all who forward my life lessons and keep my name on them. One day I received an anonymous essay about the cost of raising a child. It seemed oddly familiar. "What do you get for your money? Naming rights. First, middle and last. Glimpses of God every day. Giggles under the covers every night. More love than your heart can hold. Butterfly kisses and Velcro hugs. A hand to hold, usually covered with jam . 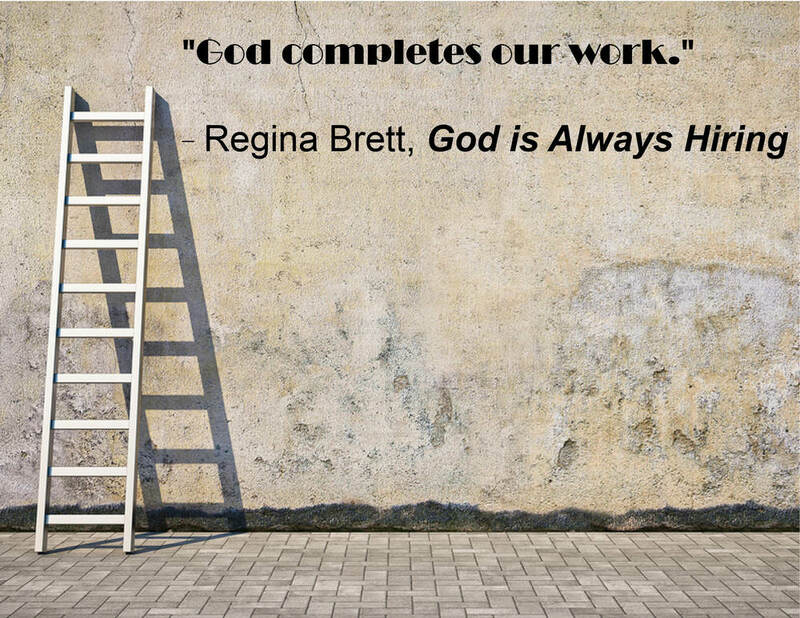 . ."
Regina Brett is the New York Times bestselling author of God Never Blinks: 50 Lessons for Life’s Little Detours, which has been published in more than 24 languages. She also wrote, Be the Miracle: 50 Lessons for Making the Impossible Possible and God Is Always Hiring: 50 Lessons for Finding Fulfilling Work. Her inspirational columns appeared in Ohio’s largest newspaper, The Plain Dealer for 17 years, where she was a finalist in 2008 and 2009 for the Pulitzer Prize in Commentary. She now writes for the Cleveland Jewish News and is syndicated by Jewish News Service. She has a master’s degree in religious studies from John Carroll University and a bachelor’s degree in journalism from Kent State University. Advice from a "Human of New York"
2009: The Pulitzer Board named Regina one of three finalists for commentary "For her range of compelling columns that move the heart, challenge authority and often trigger action while giving readers deeper insight into life's challenges." 2009: Regina won for a four-part series called The Inheritance. It told the story of her daughter's decision to have a double-mastectomy after learning that she carried a genetic mutation that increased her risk for breast cancer. 1999: Regina won for columns about her journey facing breast cancer. While going through chemotherapy and radiation treatments, she wrote extensively and candidly about her experiences in The (Akron) Beacon Journal. She also won a 2nd place Headliner Award for her series of stories about the "Hicks Babies," a black market baby-selling ring operating out of Hicks Clinic in Georgia in the late 1950's. Discovered and first written about by Regina, this story ran in newspapers across the country, prompting calls from 60 Minutes, Dateline NBC, the BBC and scores of other media outlets. 2009: The American Bar Association gave this award to Regina for her fight to change the legal system in Ohio. Defense attorneys will now have open discovery, so they will have access to police reports and witness statements to provide an adequate defense. 1999: Knight-Ridder gave Regina this coveted award for Lifetime Achievement. It is given to those who embody understanding, fairness, courage and a deep concern for the underdog. 2009: Regina was inducted into the journalists' Hall of Fame. Regina has also received numerous writing awards from the Cleveland Press Club, Society for Professional Journalists and the Ohio Associated Press. Find a charity that speaks to your heart and makes the change in the world you want to see. The Gathering Place supports, educates and empowers individuals and families touched by cancer. All programs and services are free, including support groups, counseling, yoga, reiki, etc. It's run entirely on donations. My spiritual home since 1981. The retreat house offers a wide array of programs and solitude on more than 50 acres for anyone seeking peace and renewal. My friend Kevin Conroy serves as a Roman Catholic priest in Cambodia helping the Little Sprouts, 250 children orphaned by AIDS. Meet these HIV positive kid at http://bit.ly/4G5VmY To help, make a check out to the Maryknoll Fathers and Brothers. Write "Fr. Kevin Conroy Mission Account" in the memo line.